As Halloween approaches, the atmosphere becomes more and more sinister. Walking alone in the dark has never been more terrifying. As you’re walking home after a late shift, completely exhausted and ready to jump into bed, you notice an unknown figure lurking in the park near your estate, hiding behind the trees. Convincing yourself it was just your eyes playing tricks on you, you continue to walk faster. You notice the figure getting closer to you, when suddenly, it picks up its pace and races toward you with a sharp butcher knife in hand. Your heart begins to race when you notice it’s not just anyone, but it has a pale white face, bright orange curly hair, piercing black eyes and a daunting blood red smile smeared across its mouth. The killer-clown craze has swept social media with floods of videos and pictures of these clown sightings. There is at least one post that will pop up on your newsfeed today in relation to the epidemic. The global craze originated in the US and spread rapidly to the UK, Ireland and the rest of Europe. Incidents are getting more and more bizarre. Some involve costume clad people jumping out in front of vehicles, staring at members of the public and encouraging children to follow them into the woods. Three clowns carrying fake chainsaws wandered into the grounds of a school in Blackrock recently, but have claimed they had entered ‘by mistake’. McDonalds also reported that it will scale back appearances of the Ronald McDonald clown due to the recent clown incidents. Arrests have been made in the UK and US, but no arrests have been made in Ireland yet. Even if it originally did start out as prank, it’s not all that funny anymore. Not only is the public in danger but now clowns aren’t safe either. It takes guts to mess with people. 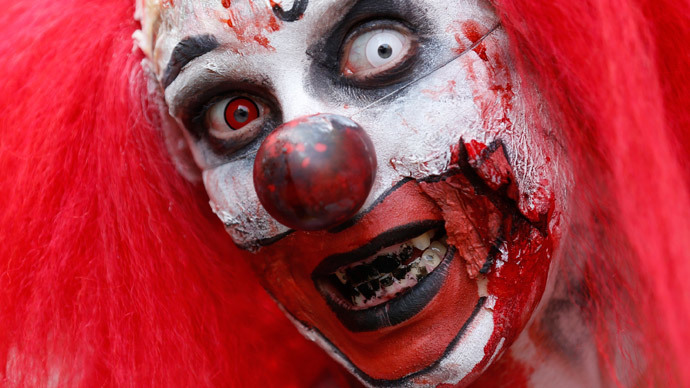 The bizarre pranks backfired in the UK and US where reports show clowns that have been punched, bottled, brutally beaten and even shot. Sightings have been said to increase as Halloween draws closer, so if you are thinking about dressing up as a clown this year, I would strongly advise against it.